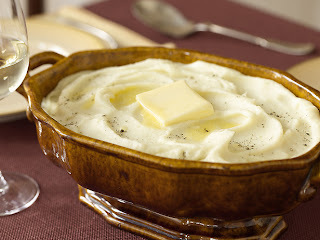 Gatlinburg Cabin Rentals: THANKSGIVING MEALS IN THE SMOKIES & BEYOND! The traditional Thanksgiving dishes really differ among families and even more so among regions of the United States. For example, there are families who bake a turkey and other families who fry one. There are some parts of the country that cant have Thanksgiving without sweet tea and other parts of the country that dont even drink the stuff! But, the following overview of traditional Thanksgiving dishes are ones that are popular pretty much across the board with a couple of specifications for different parts of the US. Remember, just because a food isnt listed here doesnt mean its not a traditional Thanksgiving food. And just because it is listed doesnt meant that it is a tradition in your family! The most traditional food of all is the Thanksgiving turkey. There are myriad ways to cook it and season it, but almost all Americans consider turkey a mainstay for the Thanksgiving meal. Although not as popular as turkey, many families serve a pink ham on Thanksgiving Day. This is usually served in addition to the turkey and not in place of. Some families like to have two different meats to choose from and really like the leftover sandwiches! 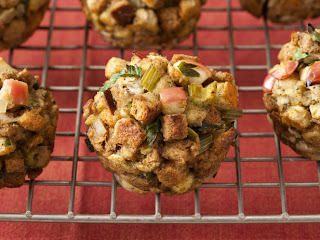 You cant cook a turkey without cooking stuffing or dressing! There are lots of different boxed and ready made stuffings and dressings you can purchase or you can make your own. When it comes to cooking your own there are so many family recipes that although it is all called stuffing and dressing it has so many different flavors that it might not seem like the same thing! Sweet potatoes, also called yams, are another traditional Thanksgiving Day food. Some families cook the yams in syrup, others make a souffl or casserole with marshmallows on top, and still others serve baked sweet potatoes with butter and brown sugar. It is believed the Pilgrims had some form of cranberry sauce during the first Thanksgiving. 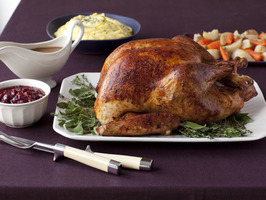 And, the tradition continues today with cranberry sauces, chutneys, and more. For many families, mashed potatoes are as much a part of Thanksgiving as the turkey! Corn on the CobCorn on the cob is present at most Thanksgiving meals across the country. Some families may serve corn of the cob as well, but the point is that corn makes it onto the list of traditional Thanksgiving foods. When it comes to vegetables and Thanksgiving there are many differences. Some parts of the country serve butterbeans, turnips, squash, collards, peas, and green beans while other parts of the country serve a green bean casserole, some kind of salad, or other vegetables. As far as Thanksgiving dessert is considered pumpkin pie and pecan pie are two of the most popular desserts across the country. There are other desserts that are also popular like mince pies, pound cakes, apple pies, and more. These are just a few of the most popular Thanksgiving traditional dishes across the United States. There is one thing for sure, though, and that is that each region of the country and even more so each family has their own traditions and favorite Thanksgiving foods.